Though I may be a financial blogger I will be very honest to say that I am not perfect when it comes to my finances. If you remember my two posts about the things that ruin my budget like here and more here I have these moments when I really over spend. I feel guilty right away and will promise once again that I won’t do it anymore and will stick to my budget truthfully so that I can save more. 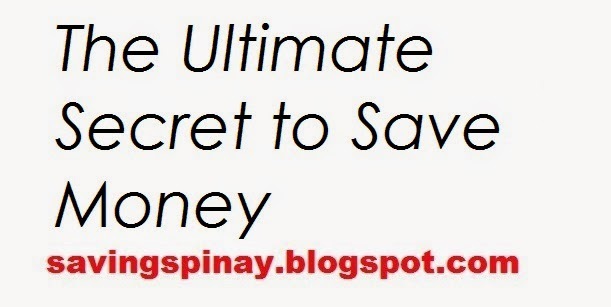 But on one morning ritual I realized one ultimate secret to save money and its very simple and doable too. For now I am exercising of mastering this skill and I know this will save my finances so much. The Secret is : AWARENESS. Awareness is the knowledge or perception of a situation or fact. It is being conscious, being able to recognize and to realize things. When we become more aware we become more wise in money matters. Be aware that you have debt. Be aware that you need to work in order to live. Be aware that you are overspending. Be aware that credit cards are not replacement for cash. Be aware that everyday is a blessing, whatever the situation may be… you are still blessed to be alive. Becoming aware of the situation will definitely lead you to act wiser than the usual. The more that you open yourself to the truth and accept the facts of what is happening the more you’ll learn the value of money. The more you will be eager to save and the more you will be encouraged to do a budget.